Below is the next portion of a multiple-part series documenting our conversation with Nic Darling, Executive VP and Founder of Major League Ultimate (2012-2016). In this installment, we chat about the future of MLU, versions of MLU and MLU as a business. SLUDGE: Is there any chance for MLU to be resurrected in some form? Nic: I don't know why it wouldn't. It's by far the most powerful brand around the sport. If we're gonna keep calling the sport Ultimate, then what else would you call the league, but Major League Ultimate? There's no other name for it that works. [MLU] is by far the most powerful brand around the sport. 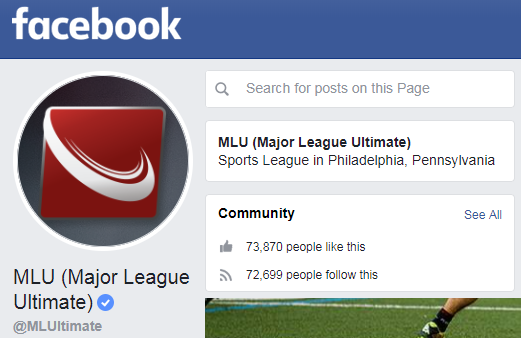 If we're gonna keep calling the sport Ultimate, then what else would you call the league, but Major League Ultimate? And I think that the assets still have value, there's still followers on everything, a decent number of them. They don't go away. If you kick those things back up, you reawaken that machine, it's still there. Until these platforms die, those things are still there. People don't unfollow anything. There were a couple of people who came and approached, and I don't know where this has gone, because I haven't been involved, but I know that people have come and approached the investors about the Twitter page, Facebook, and using them for new projects. Maybe that's moved along, I don't know, but I know that those conversations have happened. I would love to see the brand rise again, as it were. I think it's a really strong brand and a really strong name. I think the logo's strong. I would love to see somebody do something with it to be honest. I would love to see the [MLU] brand rise again...I think it's a really strong brand and a really strong name. I would love to see somebody do something with it to be honest. SLUDGE: Was there ever talk about the MLU transforming into a mixed league? Nic: One of the things that we talked about and researched pretty heavily over the 2016 season were ideas for a mixed Ultimate. We looked at a lot. And I don't mean looked at like, "Oh, we thought about it and talked about it." I mean I went to sponsors, I went to Comcast, I went to TV partners, we talked about it in depth, got feedback from their marketing departments and got some feel for how we might think about approaching that. And it seems like a big lift, still, but compared to...starting an Ultimate League. I guess it's not that big a lift anyway. what we thought about all the time was there may be, again, like Ultimate in general, there may be a more difficult path that has a higher return, which is why we started talking about mixed as an idea. So when you go pitch sponsors and pitch people like that, they're much quicker to listen (and I'm not crediting this with any value, but investors, sponsors) because we were pitching a men's league. And that's just the way it is. That doesn't mean that that's right, and it also, what we thought about all the time was there may be, again, like Ultimate in general, there may be a more difficult path that has a higher return, which is why we started talking about mixed as an idea. Could we make that jump? It would be difficult, we would lose some things, but we would gain other things in the process. It was possible, and there was definitely some interest. SLUDGE: What about a women's MLU? Nic: Yeah, so mixed was just one of the ideas. There were a couple of other ideas. One was to have a mirrored women's league that would play sort of same travel schedule, same stadium kinda thing, double-header approach, there were a bunch of different ideas. There were different ideas constantly, so it's hard to separate these out. SLUDGE: When did this start? Nic: From the early days, we talked about how do women play into this on the field, because from the first days Lindi Sabloff, MLU Chief Financial Officer, was on our team. She was one of the primary founders. She helped me draw our initial corporate structure, all of our initial finances. She helped us put together. And so, from the beginning, we talked about how in the long run does this play out. David Kucherlapati was also big on bouncing ideas around. And it was always a long-term thing anyway, that that would be part of the way that this would play out. SLUDGE: How close did it get to becoming a reality? Nic: It was just constantly in the conversation. Because innovating sports is what we needed to be able to do on some level. And in the beginning, we weren't really doing that. We were mimicking sports that existed. Some of the brands we talked to had interest in a women’s MLU because they wanted to reach that audience very, very badly. Again, we come back to the real time thing. Sports is the best way for brands to reach audiences in real time in a lot of ways, and that audience is largely 18 to 45-year-old men demo. And so reaching women of that age range is really challenging in any kind of live real-time aspect. And so there's some attraction to that idea. It was also just a good time to start having that conversation, women's soccer, with the accomplishments that they had, actually finally getting some massive TV audience behind a women's sport, in a way that hadn't been seen before. There are a lot of things that have been turning over. And the women's part of the game is something we talked about from day one. We couldn't wrap our heads around how to tackle it in a way that was manageable from our perspective. There were no shortcuts in it, whereas the men's game had more shortcuts into raising money and things like that. There were people who were ready to do that that weren't necessarily ready to go for a mixed or women's. Mixed has its own enormous challenges, when you start thinking about it as a professional sport. You obviously have to make decisions about how you treat gender, which we were pretty clear about. So we put a presentation together, put it in front of the Board of Investors as a pitch for the 2017 season. When you get into the boardroom, the on-the-field product didn't have much to do with the discussion. Not really. It makes people feel good if things are going well on the field, and that's nice because it adds a little bit of positivity to the conversation, even when you're looking at numbers that are tough. But in the end we had investors and we had people working for us who were there to try to make this financially viable. And you can have a great game... We had a couple of games where there were a lot of people [in attendance] but the revenue wasn't right. Too many tickets given away...the concession deal wasn't good...the stadium was too expensive. Then when you run the numbers in a year, you're like, "Oh, that felt like a great game when we were there. Energy was good, it was a good crowd, the game was great. But on the books it's a bad game." SLUDGE: I definitely think that’s how the casual observer might misperceive semi-pro ultimate as a viable product. Nic: Yeah. The last  championship game [between Philadelphia Spinners and Portland Stags], we probably did five times the revenue that we did at any normal game. But I don't think we made much more money on the game. SLUDGE: Five times?! Was this revenue compared to other championships or other regular season games? Nic: To other regular season games. We did probably five times the revenue, but probably similar above the line. So not much more than any other profitable game. And profitable is hard to pinpoint too. Because no game's been profitable. It just depends how you draw those lines of profitability. Does a game make money? Or what are you factoring into that game? Are you just including the stadium costs and the refs? Or do we include travel? (The most expensive thing out there.) There's all these different elements that we did, and it's hard to make a distinction. Nic: It didn't...I feel like we would have won that battle...I know we would have won that battle. I think the failure in the model was one of vision. I think that if I could do one thing differently in the last year, I would have spent less time on operations, and a lot more time selling this idea to investors—and to people with money, basically. Because the one thing that we underestimated is how much money it really takes to do this. If you wanna get to profitability, it takes a lot of money. And we accomplished a lot, with very little. We still had a lot of money by the standards of the sport at the point it was at, but we weren't even close really to the level of investment it would take to click over. And I think that that was the main flaw in the model. And it wasn't an unknown one, we kind of knew it was there, but there was always, we need to get just a little further before we go, find that cash, we need to go a little deeper before we find it. But I really, particularly in retrospect, wish I had spent a significant amount more time over the last year finding other money, and more money. But I got very hung up in operations, and not in that job, which is the job I probably should've been doing more. We were looking at how to name a League Commissioner after the 2016 season, but we ended up going more in the marketing. We ended up investing the money we would have spent there in marketing company that helped us develop the sponsorship outreach that we were doing, and in the ticket sales department, which had already started to really kick things up. It was really cool actually watching them. And that was the other thing is if you look at the company, we never invested the money that we needed to make the money we needed to. If you wanna sell tickets, you have to sell tickets. You can't just expect people to buy tickets. You have to sell them. Once we, just even started selling them, we were like, "Oh, okay, this is how this works." But you need to invest a lot of money into those programs. Into building them out, staffing them, giving them the materials they need, writing scripts, putting someone in charge who really knows what they're doing. And we just, frankly, needed to invest more and that meant we needed to go get more and that meant we should have been selling more. [MLU] still had a lot of money by the standards of the sport at the point it was at, but we weren't even close really to the level of investment it would take to click over. And I think that that was the main flaw in the model. SLUDGE: Was MLU - as a company - a success in its inaugural year (2013)? Nic: I wouldn't call it a huge success. We didn't come out of the gate and surprise anybody. And in some cases, there were probably surprises that were negative, things would cost more than you think they're going to. You learn a lotta lessons about where you're gonna lose money and where you're gonna make money. A company like this has to be prepared to lose money for 10 years. You just have to be ready for that kind of thing. A company like this has to be prepared to lose money for 10 years. You just have to be ready for that kind of thing. Nic: Yeah. And particularly as one that's trying to do something as big in scope as this is. Even though we're not paying people much, we were doing payroll for 400 and some people every week, every other week. SLUDGE: Would you say MLU overachieved for that first season? Nic: No, I don't think we did. I think there were a couple of games here or there. A couple of wins maybe, starting the sponsorship with Innova and things like that, I think, were really positive, but no, I definitely wouldn't say we overachieved. SLUDGE: What do you remember as being the end game for MLU? Nic: I think there were a lot of differing opinions on what that was gonna be. There were a lot of people that wanted this really boot strapped slow growth, invest as little as possible, try to just build a little bit of revenue here, a little bit of revenue there. I was much more in the camp of the tipping point for this company is when we get a major brand invested and that should be the only thing we're trying to do. Until we have a major brand partner whose capable of putting money in and drawing all of the fish smaller than it into the pool, we don't have a chance. We're not gonna get by on selling tickets to events, we're not gonna get by on selling merchandise, the money is in our content and that's why our focus was so heavily on content. Until we have a major brand partner whose capable of putting money in and drawing all of the fish smaller than it into the pool, we don't have a chance. We're not gonna get by on selling tickets to events, we're not gonna get by on selling merchandise, the money is in our content and that's why our focus was so heavily on content. On social media, on websites, on the video stuff, on statistics and all those pieces were coming together to a point where we were getting conversations. I got to go to Detroit and sit down with Fiat and all their head marketing people and have a conversation. And I had to pitch Zappos....I had to go to LA and meet with Red Bull. I got to do these things because, while everything was pretty raw it was all there and when we'd pitch these brands they could look at it and they could see it. They could see the numbers, they could see the impressions, the views, the engagement and they could buy into it. The way I always thought about MLU was that we were a media company that produced our own product. We didn't cover somebody else's, we made our own.